Is that a man purse in your pants, or are you just wired to see me? Clearly, the highlight of Hidden Man Purse Week here at the Satchel Pages is today’s feature: man purses so well-disguised — so thoroughly camouflaged — that they could only be called . . . Hidden Cargo Shorts. Cargo shorts, you say. Like cargo pants — the ones with the pockets all over them? What’s new about that? And what makes them qualify as hidden man purses? Well, you haven’t seen these shorts. These aren’t cargo shorts that are hidden, they’re shorts that carry hidden cargo. Don’t think Old Navy. Think . . . the geeky secret love child of James Bond and L.L. Bean. SCOTTeVEST’s Hidden Cargo Shorts and their older sibling, the SCOTTeVEST Hidden Cargo Pants, don’t just provide pockets for all your prospective purse contents. They conceal them behind a disturbingly normal pair of shorts — albeit a pair that looms maybe a size larger than what you might normally wear, the better to mask all that hidden cargo behind a purposely non-bulgey facade. 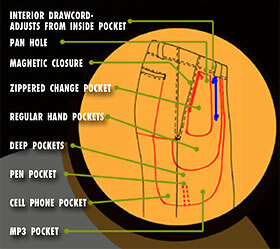 The unique No Bulge™ layered pocket design allows you to carry all of your stuff without unsightly bulges. We’ve even made sure that a large meal won’t cause problems, as the waist has hidden drawstrings to fine tune the fit. Oh, not even a large meal will cause a bulge in these, eh? And they’re trying to attract men who think carrying a man purse isn’t manly enough? Similarly, the company features a video demonstration on its website sure to entice further the “no sissy man bags for me” crowd. It’s meant to demonstrate the pants’ Teflon coating, but it shows a man dribbling water down his leg. Which makes us wonder — is this place the inverse of Victoria’s Secret, where the models are all women but men do most of the buying? The Hidden Cargo Shorts feature 11 hidden pockets for all of your (formerly) handheld gadgets, magnetic closures, and a system for wrapping cords about your buttocks that the company refers to as a Personal Area Network (PAN). This way, we suppose, if your groin isn’t Bluetooth-enabled, your cell phone can connect to the headset in your other pocket the old-fashioned way. This entry was posted on Thursday, April 6th, 2006 at 7:00 am	and is filed under Clothing, Electronics, Fashion, Gadget Bags, Hip Bags, Marketing, Unobtrusive Bags. You can follow any responses to this entry through the RSS 2.0 feed. You can leave a response, or trackback from your own site. I’ve already destroyed one small digital camera by leaving it in a pocket by mistake before putting it through the wash. Can’t imagine going through eleven pockets whenever it’s time for laundry.